“Data from cloud on the phone “, it may appear as a buzzing sentence to you. 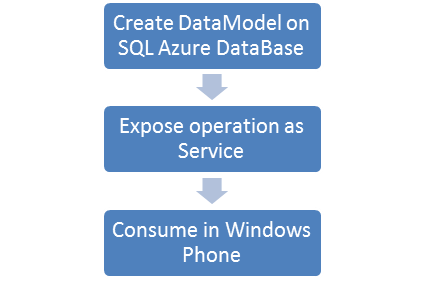 In this post, I try to minimize complexity of accessing data from cloud to be specific from SQL Azure in Windows Phone. 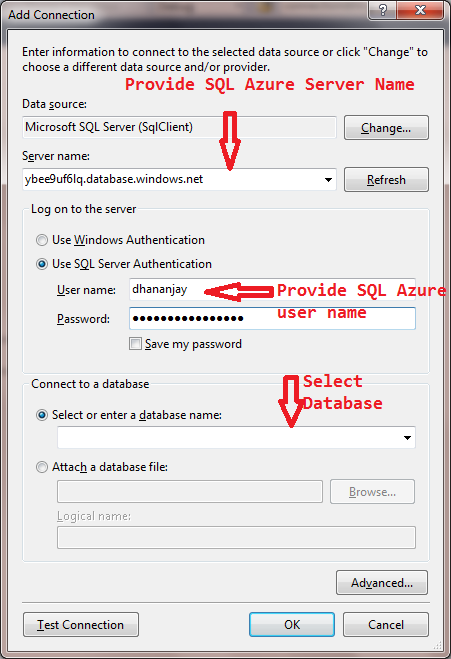 In this post I will walkthrough step by step accessing data from SQL Azure in Windows Phone. I have divided task in three parts. 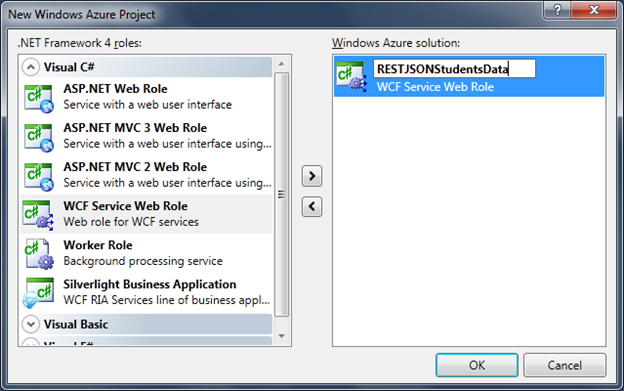 We will expose all the operation on Student database residing in SQL Azure as WCF REST Service. In this case REST is working on JSON data. Very first let us set up the project. We want to expose operation as WCF Service hosted in Windows Azure. So to do that, you need to create WCF Service Role. We are going to create DataModel using LINQ to SQL Class. 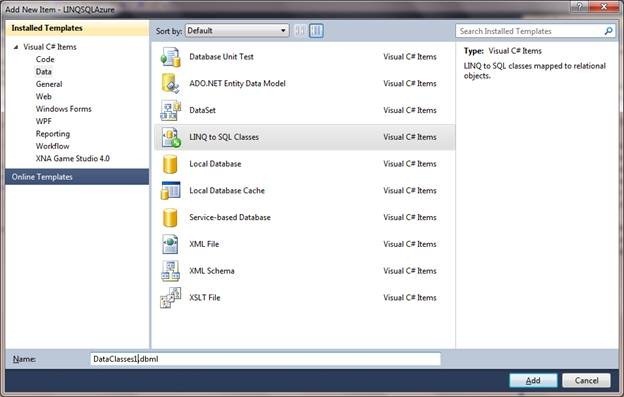 To create DataModel right click on project then select add new item and choose LINQ to SQL Class form Data tab. Next you need to choose the option Server explorer and add a new connection. In Add new connection windows provide database information for SQL Azure. From drop down you choose database of your choice. In this case I am going to select Student database. After selecting database on the designer, I am dragging and dropping table Person. On the designer (dbml) you should have Person class .As of now we have created DataModel. In solution explorer you will find dbml and dbml.cs file has been created. Data Transfer Object class represents entity from Data Model we want to expose as part of service contract. We need to create Data Transfer Object class. This class will act as Data Contract between Service and Client. To add a Data Transfer Object class go ahead and add a new class to project as below. We have created Data Contract. Now we need to create Service Contract. Service Contract must be attributed to behave as WCF REST Service. I have set request and response format as JSON. Now we need to implement the service. In Service implementation, I am querying Person table of Student database using LINQ and constructing List of PersonDTO. Next in this section we need to configure service. We need to configure service webHttpBinding to eanble it as REST Service. So in Web.Config we need to do the below changes. After configuring, Service ready for hosting. We need to host it in Windows Azure Portal. For that right click on Windows Azure project and select Package and Upload this package to one of the hosted service. Up to this step we have created and hosted WCF REST Service returning JSON. 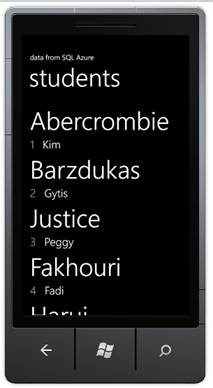 To consume REST Service in Windows Phone 7 and then parse JSON, you need to add below references in Windows Phone 7 project. We need a class to represent PersonDTO class .For that makes a class called Person at client side. As the design of the page I have put a ListBox. Data returned from cloud table will get bind to this ListBox. In above code we are creating DataContractJsonSerializer object and passing List of Person to deseriliaze because service is returning list of PersonDTO. And as mentioned earlier Person class is representing PersonDTO class. Now go ahead and press F5 to run the application. 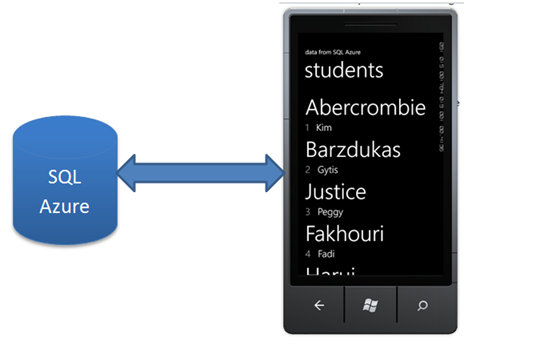 You should be getting details of Person table from School database residing on SQL Azure. In later post we will explore further to perform other CRUD operations. I hope this post is useful. Thanks for reading. HI, i want to make application in windows zure with windows phone 7 .can u please tell me its required to use windows azure toolkit for windows phone for this application or simply to add windows azure cloud application in windows phone 7 application .